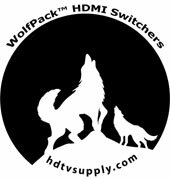 HDTV Supplys WolfPack™ 4K 8x16 (8x8x2) HDMI Matrix Switcher Over HDBaseT has simultaneous CAT5e/6/7 and HDMI outputs connects eight HDMI sources to sixteen displays. This matrix features eight HDMI outputs and each HDMI eight is mirrored to provide a CAT-Cable output which runs simultaneously. It supports the transmission of up to 4K video as well as supports high resolution digital audio formats such as LPCM 7.l CH, Dolby True HD, Dolby Digital Plus and DTS-HD Master Audio. NOTE 1: There are 2 version of this 4K WolfPack 8x16 (8x8x2) HDMI Matrix Switcher Over HDBaseT & HDCP 2.2. One has 8-HDbaseT extenders to 220 feet at 1080p and 115 feet at 4K and the other goes to 330 feet at 1080p and 175 feet at 4K. Connect a HDBaseT Receiver to each of the CAT-Cable outputs to extend the HDMI signal for multi-room connectivity. It works with Blu-Ray players, Set-Top boxes, Home Theater PCs, and game consoles that connect to an HDMI display. Any source is accessible at all times by any display by selecting it via the supplied IR Remote Control, RS232, TCP/IP or by using the selection buttons on the front panel of the HDMI Matrix Switcher Over HDBaseT. This WolfPack ™ HDMI Matrix Switcher Over HDBaseT supports High Definition Audio and is 3D signal capable. Each HDMI and HDBaseT output is mirrored. It supports up to 16 different EDID configurations to support TVs of multiple resolutions. Its flexible control is through on-panel buttons, IR remote control, RS-232 or via Ethernet protocol. NOTE 2: If both the CAT5/6 (RJ45)and the standard HDMI outputs are used, the number of total outputs would be up to 16. Each individual zone (example, VIDEO OUT 1) of the CAT5 and HDMI output would have the same picture, though. Think of it as an 8X8X2. Since the matrix switch also has 8-female HDMI outputs you can use these with the above optional stand alone HDMI extenders that have separate extended warranties if you have long distances to where your widescreens are located at. Those HDMI outputs do not support IR. Supports	wideband	IR (30-60Khz)	matrix	system,	IR	transport channel can be forward or backward. Supports GLOBAL IR input and output. NOTE 3: HDTV Supplys implementation of the HDBaseT technology and this product adds virtually zero latency to the HDMI audio and video signal, less than 7 microseconds (0.000007 sec) over 220 feet of CATx cable. At 100 feet you are talking about 3 microseconds (0.000003 sec). This means for example, in a church or auditorium, the speakers lips are always in synch with the video image on all the TVs and projectors 100's of feet away. Why not buy this HDMI Matrix Switcher Over HDBaseT today? HDTV Supply WolfPack HDMI Matrix Switcher Over HDBaseT simultaneously routes eight HDMI sources to up to sixteen displays including eight HDMI displays for direct HDMI connections and eight remote displays with the included 8-HDBaseT receivers over a single CAT5e/6/7 cable optionally up to 330ft/100m distance. Each HDMI and HDBaseT output is mirrored. It supports up to 16 different EDID configurations to support complex installations. Flexible control through on-panel buttons, IR remote control, RS-232 or Ethernet protocol is also offered. This HDMI matrix switcher can usually be integrated with many third party control systems using the RS232 port on the back of the matrix. ...and we have created a simple and very easy to use RS232 script to write your own drivers, see the RS232 User Manual. Q: I have an Edid issue with my Mac Mini going to our Blackmagic ATEM 4K Broadcast Switcher. A: I got it to work.....I went into the switcher, by using the software on your website and told the switcher to copy the EDID from output A. It came right up.....I have shut the system down a couple times and it still works. Q: I understand the CATx outs support IR but how can I control the matrix from the "HDMI outs" in faraway rooms? A: Use 3rd party RF remote controls as remote IR, via HDMI cabling, is not supported on the HDMI outs, only the CATx wiring. Q: What is EDID and what is it used for? A: Under normal circumstances, a source device (digital and analog) will require information about a connected device/display to assess what resolutions and features a re available. The source ca n then cater its output to send only resolutions and features that a re compatible with the attached device/display. Q: Why is EDID so important with the HDMI Matrix? A: The Matrix is complex piece of technology that replicates and switches between multiple inputs and outputs. Each connected source device will require one EDID to read. EDID management is carefully handled by HDMI Matrix to provide a single EDID for each source to read. Q: What options do I have to manage the EDID in the HDMI Matrix? A: First, it is important to note that each source device can only output one video/audio signal type. This includes resolutions and timings. When multiple devices/dis plays a re used, such as with the HDMI Matrix, it is important to use devices/displays that have similar or compatible	resolutions/features. This	will ensure	that	the	single video/audio signal produced by the source device is accepted by all of the connected output devices/displays. The	user has the option, through the EDID management window, to choose how the unit will manage the EDID from multiple HDMI devices/displays. Therefore the user has some control over the resolutions/features that the source devices	will	output. The	HDMI	Matrix	for	has	a	multiple	EDID management modes that will control how the EDID information from multiple devices/displays are combined, ignored, and routed. HDTV Supply includes a 1 Year Limited Warranty on this 8x8x2 Matrix HDMI Switch. The warranty states that (a) its products (the Product) will perform substantially in accordance with the accompanying written materials for a period of 1 year from the date of receipt and (b) that the Product will be free from defects in materials & workmanship under normal use & service for a period of 1 year. In order to get a warranty replacement for a defective item, HDTV Supplys Support Team will verify the product is eligible for warranty. An RMA number will then be issued. Shipped replacements will be in like new conditions, tested and all components included. HDTV Supply also sells a 3 and 5 Year Extended Warranty for this 8x8x2 Matrix HDMI Switch w/LAN & RS232 Control. Please go to Extended Warranties or see the above Options to purchase it.